Last weekend I went to the BloggyConference blog conference to learn how to be a better blogger for all of you, the greatest community on plant Earth. BloggyCon is a little different than the blogging conferences I attended in the past because it was held at Cedar Point. During the day, I took a ton of notes during the sessions and networked with bloggers and brands to bring you the best content possible. At night, I rode all of the roller coasters and saw the sights at Cedar Point. It is right next to the conference hotel, how could I not? Keep reading and pin this post! I made a video about Halloweekend and embedded it in this post! Just so you don’t think I’m biased because I got free stuff, I here to tell you I didn't get free stuff. I paid for my tickets to Cedar Point. My enthusiasm in the video is fueled with 6 hours sleep for the weekend total and a ton of coffee. BloggyCon at Cedar Point also allowed me to right another hideous wrong of my childhood. I grew up a short drive away. My family never needed to stay in Hotel Breakers. Thanks to BloggyCon I actually went inside Hotel Breakers, the oldest hotel on Cedar Point property. They just renovated it for 2015. The Breakers is lovely and modern yet still invokes that old timey beachy architecture and feel the area is known for. I enjoyed that slice of local history with a side of a giant fiberglass cow. After the conference, I met up with my sister, brother-in-law, and Mr. 7 of 10 (they are season pass holders) to check out Halloweekends opening weekend. During the daylight hours we rode the roller coasters and thrill rides because we’re all adrenaline junkies and Mr. 7 of 10 is a little too old for the daytime Halloween themed kid activates. Follow me @condoblues on Instagram for more cute animals and real time fun like this! At night we enjoyed the more grown up scare zones and haunted houses. Ironically, even though I worked in a haunted house like my sister and brother-in-law, I’m not the high intensity scare person like they are. Fortunately, all of Cedar Point’s haunted houses are rated by intensity which made it easy to back Mr. 7 of 10’s play when he declared something “boring” (Kid Code for no way too scary) and our group moved on. 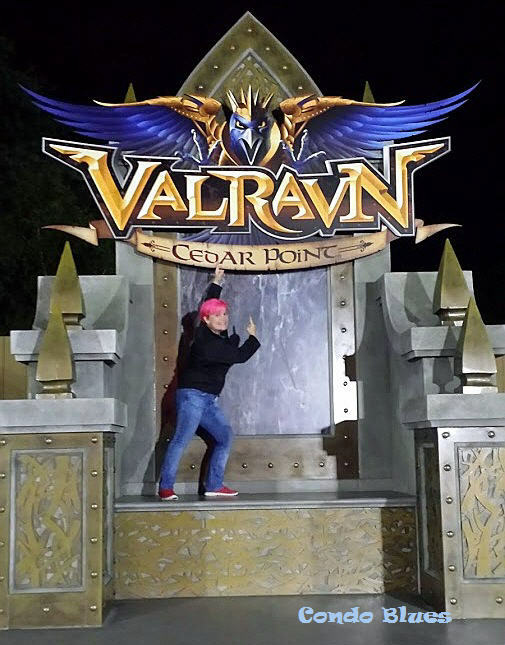 We drooled over the display for 2016’s new roller coaster Valravin (Val-ray-vin.) Valravin will be a floorless coaster with a 214-foot-long vertical drop straight down. I can’t wait. I don't get to do much with Mr. 7 of 10 by himself so it was great to spend some World's Most Fabulous Aunt (trademark pending) time with him. I promised I would jump into Mr. 7 of 10’s arms Scooby Doo style if I got scared in the haunted houses. On the spinning rides I said I’d show my love by barfing on him - the only member of The 10 to receive such an honor. Sadly neither happened. 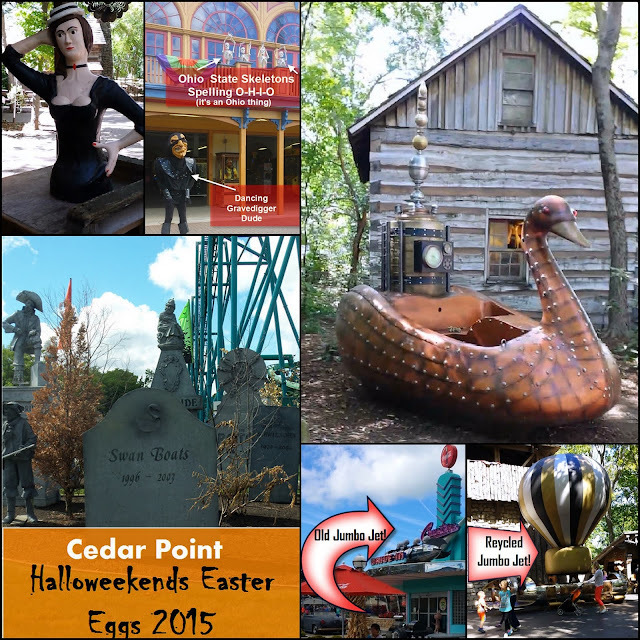 I whipped out my phone on the spot and shot a bunch of video to show you some of the Cedar Point Easter Eggs and give you a report on everything Cedar Point’s Halloweekends has to offer for 2015. What Easter Eggs did you see at Cedar Point this year?